"I love it man, I love it. I am learning new things and I enjoy it." – Roy Golding, Nottingham customer. Despite a strong background in painting and decorating Roy's been unemployed for a while now. He has been a full-time carer for his father for the last 10 years and he's been battling his own mental health and substance abuse issues. Now in recovery and at age 63 with few qualifications to his name Roy thought it was about time he started breaking down his barriers to employment so he came to us for help. Roy got himself signed up for a couple of our accredited training courses, namely our 'IT Skills' and 'Developing Personal Power' courses. 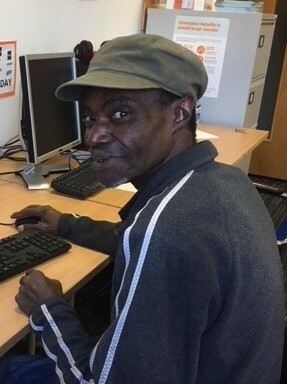 Roy's IT skills came on leaps and bounds throughout the duration of the course and he now has his 'City & Guilds Level 1 Award for IT users' to show for it. Excited about his learning and keen to improve his confidence Roy enroled on the 'Developing Personal Power' training – a course designed to provide participants with increased resilience in the workplace. Roy’s unstoppable enthusiasm for learning has been an inspiration for staff and other learners and we're happy to report he's been successful in achieveing his SFEDI Level 1 Award in Passport to Enterprise and Employment. Of his learning experience Roy said: "It was fantastic. I really enjoyed it and learnt a lot. My confidence is better than before." Roy's optimistic about the future and we are too. Class tutor, Amy Butler and the rest of our Nottingham team will continue to support Roy in his journey to employment. Follow us on Twitter and we'll let you know how he gets on. If you're keen to get back into work but just need that little bit of support – signup for our free employment training programme and we'll work with you to overcome your barriers and get you the job you want.